Mainstream media has reported little about the arrest and likely extradition of Wikileaks publisher Julian Assange, who was literally sold out for the proverbial 30 pieces of silver (or in this case it was a $4.2 billion IMF loan to Ecuador approved just last month)! Vice President Mike Pence was in Ecuador last June to push a quid pro quo with the recently elected Ecuadorian president, Lenin Moreno: You hand us Assange and we'll make sure you get your loan. “In a divided Washington, few causes have as much bipartisan support as prosecuting WikiLeaks founder Julian Assange,” reports The Associated Press. As you might have heard, late last week the feds accidentally revealed they’ve prepared secret charges against Assange — who’s feared extradition to the United States for years and since 2012 has been hiding out inside Ecuador’s embassy in London. To begin with, please pause a moment to ponder the term “secret charges” — the sort of thing we might normally associate with Nazi Germany or Soviet Russia. 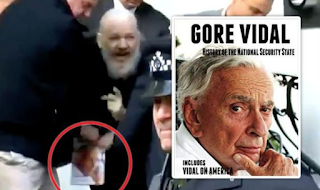 As Assange was dragged out, it’s worth noting, he was holding in his hand a book by Gore Vidal, History of the National Security State. Assange was indicted by the US Attorney's Eastern District of Virginia's "espionage court" on charges of conspiracy to hack a government computer. As whistleblower John Kiriakou Tweeted today, his chance of a fair trial in that court is virtually none. His chance of being extradited by a UK all too eager to please its former colony is virtually 100 percent. The conspiracy charge is far less than many expected, carrying a possible jail term of a mere five years. 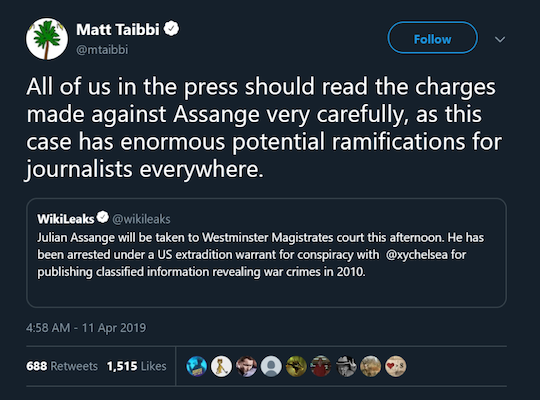 This is likely to ease the way - and provide cover - for the UK to extradite Assange to the US where there is little doubt additional charges - perhaps including espionage with a possible death sentence - will be added to the mix. Many on the Left who once lauded the publication of the Pentagon Papers in 70s [stolen papers which indicted the secret bombings our nation performed in Viet Nam] seem to want to hang Assange for doing the same today as he exposed a lot of politicians for their own dirty laundry, especially Hillary Clinton. 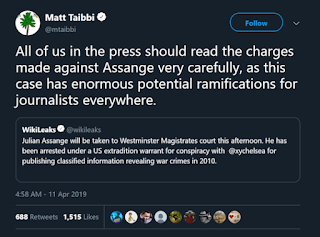 Indeed, it will not surprise me [as I posted on twitter and Yahoo yesterday] if Assange has even more damaging material tucked away that he can he use as his “get-out-of-jail-free” bargaining chip. In the pre-trial stage - which has begun today - we will see a distortion of facts in attempt to establish that the charges he faces have nothing to do with a free press or an independent media. Already national security state apologists are dutifully repeating claims that this is only about hacking. He is being charged over hacking, they say, because he is accused of helping Pvt. Manning get secure documents into the hands of Wikileaks. I’m willing to bet few journalists or media will come to his defense uttering the usual BS that he wasn’t “one of them.’ Indeed, a few of them already have smeared him on twitter and on their own media [why bother naming them here]. One of the few which has publicly rallied to his cause is a long-time freedom warrior, the Rutherford Inst. The Rutherford Institute has denounced the U.S. government’s attempts to extradite and prosecute Wikileaks founder Julian Assange for his part in disclosing information relating to government misconduct that is within the public’s right to know. *This press release is also available at www.rutherford.org. Free enterprise, limited government, individual freedom! A Safe Space Heater for Your Home! What is the main concern about space heaters today? Safety. The Envi is not like any other heater you will find on the market. It is safe for the entire family. With the Envi, you can rest assured that your children and pets are safe and warm. · The envi is cool to the touch. It reaches only 90 degrees F on the front surface. · The envi has WallSens Technology. It will not heat without being mounted to the wall. · The envi has a built in Automatic Thermal cutoff. If air from the envi exceeds a safe temperature, the envi heater will power off. · The envi is wall-mounted. It cannot be knocked over, tipped over, or tripped over. · The envi can be left on 24/7 unattended. · The envi is fanless. It won't catch little fingers or hair. With thought and foresight, the envi was born. We have created a safe space heater that will last for many years and keep you and your family safe. The Envi is also a healthy space heater that is great for those with asthma or respiratory problems. Save 20% by using this link! You Can’t Buy Life Insurance After You’re Dead-Prepare NOW for Emergencies. 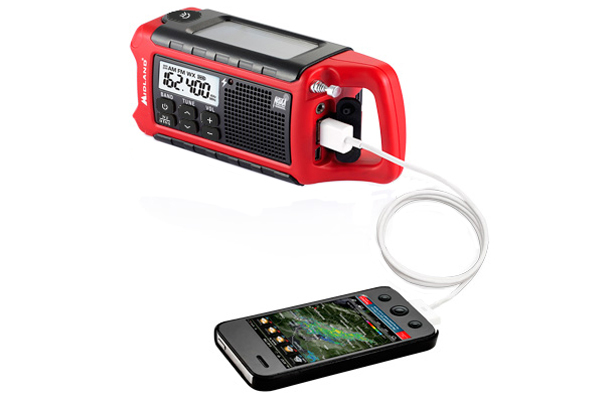 Resources-Solar Chargers back in stock-Grab one now as they go fast. Our supply on eBay sold out in ten minutes! I sure hope he has some big dirt on Hillary! Is the next generation screwed or what?